A friend of mine has an early 2004 dual 2.5 PCI-X G5 and we were wondering if we could take off the LCU *liquid cooling unit* and swap it out for regular heatsinks. Understandable that the fans will run a little louder, but it will also preserve the logicboard and PSU from being zapped with coolant. Could this be accomplished and then re-calibrated with the AHT 2.5.8 CD? The answer to my question is yes. I bought a dual 2 GHz AGP G5 due to intermittent power issues, so i swapped out the 600W ACBel PSU for my Liteon 600W PSU and i ran the dual 2 GHz cpu's for a couple of weeks. Then today i swapped out the 2 GHz cpu's with the 2.5 GHz AGP cpu's and attached them to the heatsinks with new Arctic Silver 5 compound, and ran the 2.5.8 AHD disc and the thermal calibration passed. Now i have a dual 2.5 GHz AGP G5 running on air so no more LCS units for me!!! Using Temperature monitor, my cpu's idle around 47 to 50ºC. If it goes over 65ºC then i hear the fans slightly. Then it drops back to idle. No badge, just a true answer. That's what i am seeking. Can you perform this air cooled mod with a late 2005 issued G5 2.5GHz DC using the heatsinks from either a 2.0 or 2.3GHZ Dual Core G5 PowerPC? Please check your processors, logicboard and power supply first to make sure the leaking didn't affect those parts. To do so, there are steps on this site that will show you how to take these parts out and then check them to see if there is any corrosion. If there is, you will have to replace those parts that have been affected. 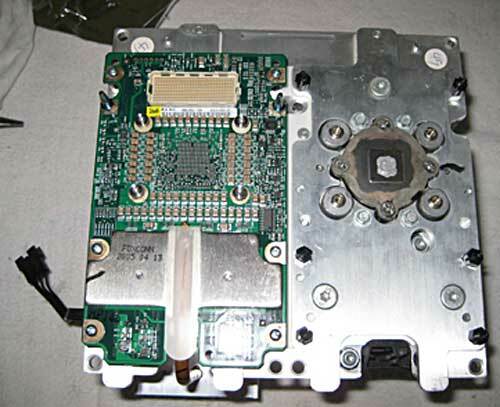 If all is good and no parts have leaked, then you take out the LCS unit with the processors as a whole. Unscrew the 8 logicboard/LCS secure screws. Pull out the LCS unit. Then you remove the processors from the LCS unit itself by removing the 12 - #1 Philip head screws and the 8 Allen head screws securing the processor to the LCS unit. Then carefully lift the processors from the LCS and set them on a static free surface. Then you will want to clear off the old thermal paste with afterwards clean with rubbing alcohol to make sure the surface is really clean. Don't worry about taking off the single heatpipe that is on the rear of the processor, this will not stick past the original heatsink. Then do the same with the Heatsinks from the parts machine you acquired. Attach the processor to a heatsink and then secure the 4 allen head screws and tighten them like you would a car tire. once they are snug (not over tightened) then you can screw in the 6 - #1 Philip head screws. Repeat the same process for the second processor. Now take the processor/heatsink combo and put it in the upper most logicboard/processor slot. Push firmly but not overly hard until everything is snug and connected. Once this is done, you can screw in the long allen head screws that secured the LCS to the logicboard. Repeat the same process for the bottom logicboard/processor slot. Then you have a pair of processors that are now air cooled. Put in the plastic flow cover that came from the heatsinks, not the LCS unit (that sits right on front of the heatsinks) and then put in the front fans, then the Air Baffle, then the side cover. Boot from the AHD 2.5.8 and run "Thermal Calibration". If there are no issues, you can now restart in OS X with your new air cooled G5. I forgot to mention, when attaching the heatsinks to the processors, i used Artic Silver 5 thermal compound. I put a little dab on the processor dyes than seated the processor on the heatsink then did up the allen head screws and then the Philips head screws. This sounds great and everything but you left the most important part out... Did you use the Heat transfer modules and attach a fan to that or did you just use another heatsink. What kind of heatsink was used? This would be an awesome mod. i left the heat transfer modules alone. On this reference pic http://www.xlr8yourmac.com/systems/G5_Co... the bottom aluminum heatpipe was left alone. On mine it's copper. As for the heatsinks, i used the original heatsinks from a Dual 2.0 GHz AGP G5. Since they lined up and aligned properly with the old plate from the LCS that was there. Last week I had to change out the power supply on one of these liquid cooled units and the AHT 2.5.8 CD worked and the Thermal Re-Calibration software worked with it. All the mounts looked to be in the right place and the plastic sheeting looked right also on the Mother Board. I ran the AHT 2.5.8 CD and the Thermal Re-Calibration and I got an error message tafs is out of range on CPU1 - replace processor. I'm guessing it errored on CPU1 because thats the first CPU it tested. Any ideas? First, make sure the heatsink is firmly seated onto the processor. Use the 4 hexbolts to tighten the cpu to the heatsink first. Diagonal like a car tire pattern. Let's eliminate that issue first, then screw in the 6 Phillips screws to secure the heatsink to the rest of the processor. Now take out cpu1 and rerun the calibration tests. Yes the G5 will run on a single cpu. From there, if the calibration works on cpu0, then take that out and put in cpu1 into cpu0's slot. Rerun the calibration and see what that does. If it gives you the same message, but saying it's cpu0, then you know the processor is blown. If it says it's fine, then take the original cpu0 and put it into cpu1's slot. Rerun the calibration and see if the G5 behaves nicely. Yes, i know this is a lengthy process, but it helps to diagnose if the cpu's are bad.